Sustainability should not just be a buzzword during Earth Month. The fact that everybody either shops for or eats groceries means the whole grocery shopping experience is a good time to reflect and improve upon what we can personally do to embrace issues of sustainability. 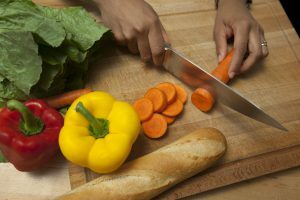 With a bit of forethought, meal planning before grocery shopping can help individuals and families apply sustainable best practices for environmental, economic, and social well-being. 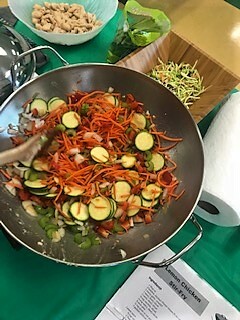 In fact, many of the principles of sustainability can be effectively applied to both meal planning and grocery shopping. RESPECT yourself. Good nutrition is one of the keys to a healthy life. Improve health by keeping a balanced diet. Vow to make healthier food choices for personal health and the environment. REFUSE to use food products that do not fit your principles of sustainability. This may mean buying food with less packaging, eating more locally-grown fruits and vegetables, or looking for foods labeled as more responsibly sourced. REDUCE the amount of food thrown out. Planning meals ahead of time and writing out a grocery list are excellent ways to start living sustainably. Planning not only saves money on groceries, it can save time and decrease the amount of personal food waste a family contributes. (Remember, freezing products can prolong their life, so if you find that you’ve overbought, try preserving some of your bounty for later use.) Reducing the number of trips to the grocery store also can help save on fuel and transportation costs. REUSE /REPURPOSE food for another occasion. Careful meal planning helps ensure that leftovers from one meal can be incorporated into the next one, thereby reducing food waste. BE RESPONSIBLE! Use what you buy. Stock up on low-cost healthy grain products like whole-wheat noodles, brown rice, and store-brand cereals and oatmeal. Purchase fruits and vegetables that are in season and cost less. In addition, do not forget that frozen, dried, and canned fruits and vegetables can play an important part in meal planning. Buy the largest size you can effectively use before it reaches the expiration date – and look for the items with the latest dates. Purchase store brands or generic brands whenever possible. Keep in mind smaller containers tend to cost more, no matter what the food group. Buying larger packages and dividing them into smaller portions can save money and reduce the amount of packaging that ends up in the landfill. Investing in small, reusable storage containers will save money and reduce waste in the end. Practice Meatless Monday. The protein group provides inexpensive protein sources like beans, lentils, and eggs, which can be substituted for meat in many meals. Protein does not have to be the most expensive item purchased. Consulting the store’s weekly sales flyer during meal planning can help you plan meals around meat and poultry items that are on sale. Prepare food your family will actually eat. There are two schools of thought here: preparing just enough for one meal or preparing big-batch recipes that provide leftovers which can be frozen for later use. Either practice can be sustainable. Freeze leftovers only if you’re going to use them. Otherwise, cut down on the amount of food cooked to help reduce food waste. Learn how to cook. Prepare and eat more meals at home. It is sustainable, good for you, and delicious. 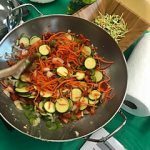 Meals cooked at home are more nutritious, less expensive, and result in less overall waste, such as packaging. 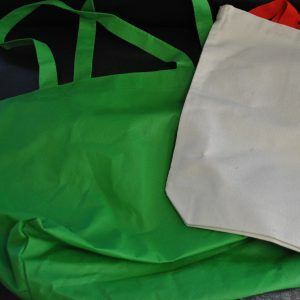 Two additional ways to be more sustainable when grocery shopping are to use reusable shopping bags and to stop using single-use plastic produce bags. Plastic grocery bags choke our landfills and end up in our water bodies. They are not biodegradable and can last thousands of years virtually intact. Reusable shopping bags are made from recycled materials and can drastically reduce the number of plastic bags that end up in the trash each year. I love spring cleaning. Well, I love spring. I wish someone else would do the cleaning. It does feel nice to have everything clean and sparkling for those sunny spring days. According to a 2018 survey by the American Cleaning Institute, nearly 76% of households engage in spring cleaning each year. 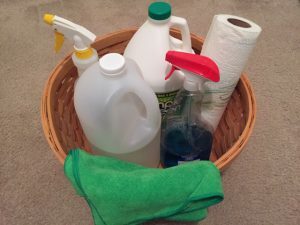 These spring cleaners report deep cleaning and clearing clutter as the top two reasons for this annual springtime spruce up. 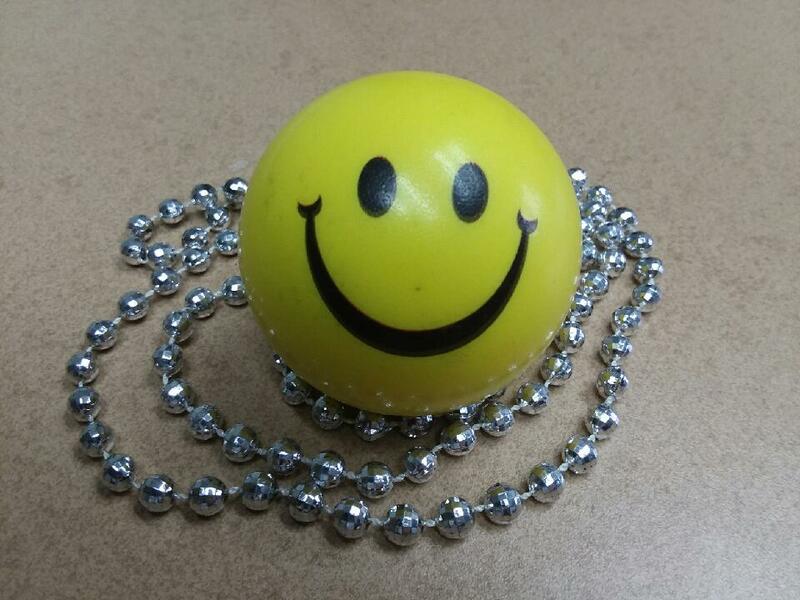 Personal belongings hold a host of memories and other emotional attachments. This means stuff can accumulate in closets, drawers, cabinets, and other places. In my own life, I try to get rid of items I haven’t used in the last year. Others may use different criteria. Pick a closet, cabinet, or other area to de-clutter and start by sorting. Separate items into boxes or baskets labeled: Keep, Donate/Sell, Recycle, Trash. This is also a great way to help children make decisions about their stuff. It always makes me feel better to clear the clutter and organize a messy cabinet or closet. Deep cleaning involves going through each room and cleaning it to a higher standard or reaching dirt that might get missed in a regular cleaning routine. On deep cleaning days, wash window and shower curtains, wash windows and mirrors, scrub floors, wash or wipe down walls, baseboards, and doors. Dust or wipe down light fixtures, ceiling fans, furniture, and shelves. Other tasks might include vacuuming under furniture, cleaning the carpets and rugs, and cleaning under and behind appliances. Spring cleaning takes a little extra elbow grease compared to the regular cleaning routine. If you find this overwhelming, start small by choosing a room or even smaller by choosing a closet or cabinet. Once you see the difference, it will motivate you to tackle the next job. Healthy Homes: Dealing with Household Clutter. 2015. For those of us who read food labels, grocery shopping can be a confusing maze of health claims enticing us to make what look like healthy choices. But, are these choices really healthy? When I noticed that my shampoo was gluten-free, I decided it was time to refresh my knowledge on food and product labels and figure out what is behind the label. 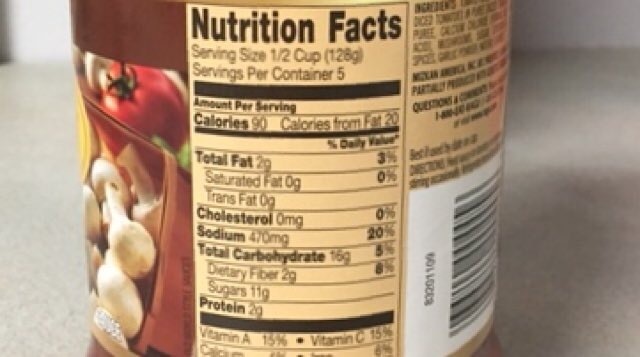 The Nutrition Labeling and Education Act of 1990, regulated by the Food and Drug Administration (FDA), requires the labeling of most food and sets consistent standards for certain nutritional content and health claims. Much of the consistent information we find on food products is the result of this regulation. Food products must contain the Nutrition Facts panel, use common household measurements for serving sizes, and clearly identify any food allergens. Ingredients must be listed in descending order by weight using common names and clearly identifying certified color additives such as “FD&C Red No. 40” or “Red 40.” Raw vegetables, fruits, and seafood are exempt from nutrition labeling requirements. The FDA regulates the use of the word “healthy” on food products. To use this term, a food product must be low in fat and saturated fat, low in cholesterol, contain less than 480 mg of sodium, and contain at least 10% of the Daily Value per serving for vitamins A, C, calcium, iron, protein, or fiber. Exceptions include raw fruits and vegetables; or a single ingredient or mixture of frozen or canned fruits and vegetables; and enriched cereal-grain products. Seafood and meat products and main dishes or meals have slightly different regulations to meet the “healthy” criteria. The United States Department of Agriculture (USDA) regulates and enforces the use of “certified organic”. To use the USDA certified organic seal, the final product must follow strict production and handling standards. Products with this seal have completed a certification process meeting standards in soil quality, animal raising practices, and pest and weed control, and certifying that they have not used synthetic fertilizers, sewage sludge, irradiation, or genetic engineering. The USDA also regulates labels for meat and meat products. “Certified” means the USDA has officially evaluated a meat product for class, grade, or other quality characteristics (e.g., “Certified Angus Beef”). Products labelled “natural” must not contain artificial ingredients, added color, and must be minimally processed. The label must explain the use of the word “natural” such as “no artificial ingredients; minimally processed”. Meat and meat products claiming “no hormones added” cannot be used on the labels of pork or poultry unless it is followed by a statement that says “Federal regulations prohibit the use of hormones.” Beef products can make the claim if the producer has documentation showing no hormones have been used in raising the animals. Meat and poultry producers must also provide appropriate documentation that animals were raised without antibiotics to use the label “no antibiotics added”. The term “Chemical free” is not allowed on labels. Not all front-of-the-box marketing terms and labels are defined by the FDA. When reading labels and deciphering health information, watch out for misleading terms and health claims that seem to good to be true. Learn what health claims are approved and which ones are not. Remember, packaging is designed to attract your attention and entice you to make a purchase. Read the Nutrition Facts panel and ingredients list to make the healthiest choice for you and your family. Juice: Juice must be 100% juice. If less than 100% juice, the product must use the terms cocktail, beverage or drink. High or Excellent Source: Contains more than 20% of the Daily Value per serving. Good Source: Contains 10-19% of the Daily Value per serving. Lean: Seafood or meat contains less than 10 g total fat, 4.5 g or less saturated fat, and less than 95 mg cholesterol per serving. Extra Lean: Seafood or meat products contain less than 5 g total fat, less than 2 g saturated fat and less than 95 mg cholesterol per serving. Fiber Claims:­ If a product makes a fiber claim but the food is not low-fat, then the label must state the total fat per serving. Antioxidant Claims: The nutrients must be included as part of the claim for example, high in antioxidant vitamins C & E.
Whole Grain and Heart Disease Claims: Food product contains 51% or more whole grain ingredients. Gluten-free: This is a voluntary label for food products that are either naturally gluten free or gluten (e.g., wheat flour) has been removed to less than 20 ppm. Though not a widely publicized day on most calendars, Random Acts of Kindness Day, February 17th, is worth some attention. Random Acts of Kindness Day is a day when everybody gets the chance to do something nice for someone else. There’s a bit of debate over where and when it started. But it is generally believed to have started in Denver, Colorado in 1995. Then it spread to New Zealand in 2004. Since it apparently worked so well, it has since spread as an international holiday. So, now, we globally have a day dedicated to doing nice things for others. Why Set Aside a Special Day? Did someone recently cut you off in traffic? Are you tired of mean social media rants? Do too many of the people you encounter lately just seem rude? Does the only news you get seem to all be bad news? Then having one day to both offer and receive random acts of kindness just may give you the stop and reset buttons you need. You can plan out kind acts or just wing them spontaneously. Even the littlest kind thing you do for someone else can make a big difference in their day and yours. There’s the story I heard recently of a driver who brought a hamburger to a man living under a bridge at the beach. The homeless man said it was a perfect “surf and turf” lunch. The driver said that was one of the best days he ever had. The effects of doing kind things for others is hard to scientifically pinpoint. However, multiple small case studies have shown that those practicing altruism live longer, healthier lives. * Kind deeds have been shown to reduce our stress levels and the negative physiological effects of stress on our bodies. “Happy” hormone levels increase as we care for others. There also is often a giddiness (not a scientific term) we feel when we do that nice unexpected thing for someone. Donate used business clothes to people who are going on job interviews. Let someone have that prime spot in the busy parking lot. Leave a really big tip for your wait staff person. Try a random act of kindness this February 17th. I think it will be worth it. And who knows, you may get so good at it, you start providing those random acts of kindness every day. Do you know what the different types of cholesterol are in your body? Do you know what your cholesterol levels are? Do you know why your numbers matter? 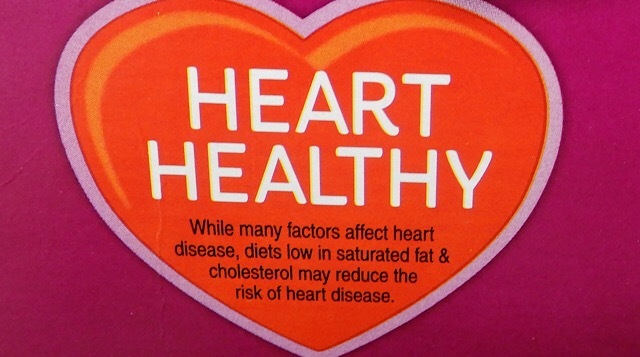 Cholesterol can be a contributing factor to heart disease. It’s important to understand your numbers so you can take the best care of yourself. Making simple changes in your daily routine can help reduce your risk of heart disease. Talking to your doctor is the first step so he or she can request blood tests to help determine your risk. One of the tests the doctor may run is called a lipid profile, which checks your body’s cholesterol. LDL cholesterol is called “bad” because it can block your arteries. The level should be less than 100 mg/dL. If it starts with “L”, aim for a lower number. HDL cholesterol is called “good” because it helps to clear out the LDL (bad) cholesterol. This number should be greater than 40 mg/dL for men and greater than 50 mg/dL for women. If it starts with “H”, aim for a higher number. Triglycerides are fat found in the blood. You want these numbers to be less than 150 mg/dL. If you don’t understand what your numbers mean, be sure to talk with your health care provider. The more you know about your numbers, the more incentive you have to make any recommended changes. 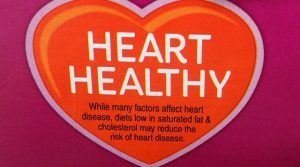 What Can Cause Unhealthy Levels of Cholesterol? Habits like smoking, lack of physical activity, and unhealthy eating patterns. What Can You Do to Help Lower the “Bad” Cholesterol and Increase the “Good” Cholesterol? You can make simple changes to your daily routine to help reduce your risk of heart disease. Eat foods like oatmeal, apples, and pears to give your body more soluble fiber. Add salmon, walnuts, and flaxseed to your diet. These are great sources of Omega-3 fatty acids. Eat less red meat and switch from whole or 2% milk to skim milk. The Mayo Clinic recommends 30 minutes of exercise at least 5 times a week. There are many different resources available to help you or someone you know quit smoking. If you lose just 5% of your body weight, it can help your heart! By making simple changes to your diet and lifestyle, you can help to reduce the risk of heart disease. Change takes time and effort, so don’t get discouraged by trying to make all the changes at once! Pick one habit to work on, such as slowly switching from whole milk to 2% to 1% then finally to skim milk. Once drinking skim milk becomes part of your everyday routine, choose another habit to work on, such as getting more exercise. Adding a half hour walk in the morning or in the evening is a great way to get you moving. To make the walk even more enjoyable, take your dog with you – pets need exercise, too! Your good health is why your numbers matter. Remember, small changes can make a big difference in improving your heart health. And since February is Heart Health Awareness month, now is a great time to start.